I don’t know about you but I love the GPS in my iPhone. I use it all the time to get where I am going. What I don’t love is that juggle you have to do between the phone and the steering wheel and having to hold it up so you can be at eye level with the road. It’s inevitable that you are going to drop it and be totally lost! That why the magnetic phone mount from Biontek is amazing! This thing works great. You can mount it to the air vent in your car and the magnet on the end sticks to the back of your smart phone using the included magnet plates you insert inside your phone case. That way you can have complete access to your phone while you are driving. The magnet works really well with my phone, I have an iPhone 5S and it has no problem holding the phone in position. Like I said I love mine for GPS but if you pair it with a hands free system it would be super convenient for phone calls too. 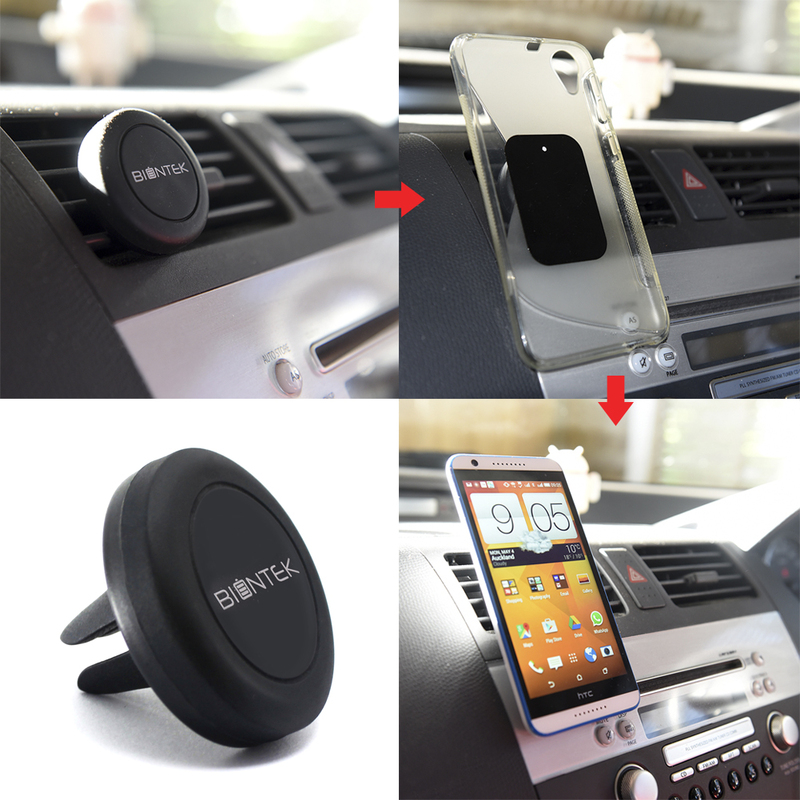 POWERFUL MAGNETIC CAR MOUNT ✔ The heavy duty magnetic force of this car vent mount is the reason you would choose BionTek over all other cell phone accessories. This magnetic universal holder by BionTek produces an intense force of attraction that will hold any smartphone in its place. Including Android, Apple, Blackberry and Microsoft devices. VIEW FROM ANY ANGLE ✔ Rotate your smartphone and swivel your display a full 360 degrees. The base of the cell phone holder remains fixed into the air vent of your car and does not move, no matter how much swiveling or rotation you do. This guarantees that your smartphone will always dock in your preferred position. EASY YOU USE ✔ This cell phone magnetic car mount holder is 10x easier to use than any other magnetic car mount holder due to its simple and complementary design. The simple Easy Clip design means you can install it in seconds! STURDY BASE ✔ The high quality rubber construction of the base of the car vent phone mount is unique and very functional as well. It guarantees that the base of the cell phone car mount will solidly hold the magnetic head to help keep your cell phone in place regardless of road vibrations or impacts. This also means it provides easy access to all the buttons and ports unlike cradle mounts! LIFETIME GUARANTEE ✔ When you order this magnetic universal car mount you are protected by a lifetime money back guarantee and world class customer service. It’s the perfect and most affordable gift for yourself, a friend or family member so go to the top right corner of this page and click the buy now button to get one delivered right away!